The Public Power Risk Management Act, which passed the House unanimously in the 113th Congress but found itself stranded in the Senate, was re-introduced on April 28 in both chambers of Congress. The legislation is strongly supported by the American Public Power Association. U.S. Reps. Doug LaMalfa R-California, and Jim Costa, D-California, re-introduced the bill in the House as H.R. 2041. Sens. James Inhofe, R-Oklahoma, and Joe Donnelly, D-Indiana, re-introduced it as S. 1111 in the Senate. The bill would allow public power utilities to enter swaps used to hedge commercial operations risks with non-financial entities such as regional utilities, natural gas distributors, and independent power generators — and not just big banks, large energy dealers, and other “swap dealers.” It would codify recent changes adopted by the Commodity Futures Trading Commission (CFTC). The legislation is substantively the same as H.R. 1038 and S. 1802, the House and Senate versions of the Public Power Risk Management Act of 2013. H.R. 1038 passed the House on a vote of 423-0 in 2013. The Senate bill had 15 bipartisan cosponsors, but failed to advance during an end-of-session logjam in December 2014. 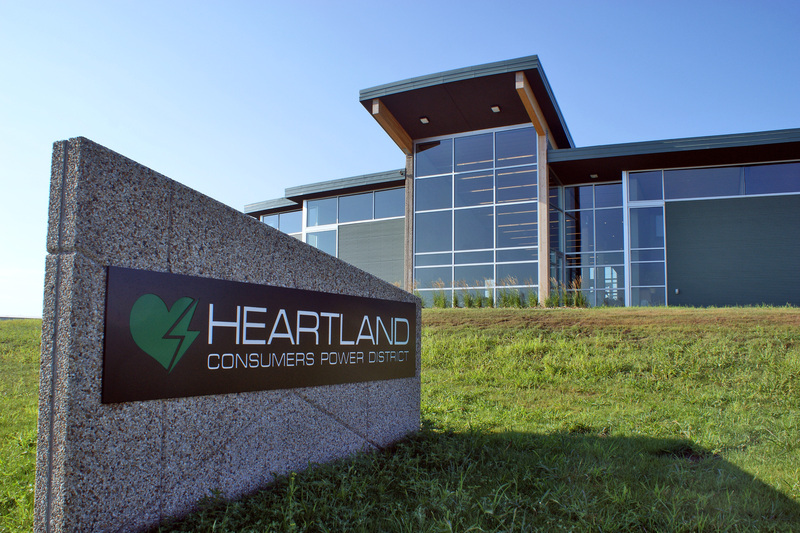 After meeting with members of Heartland’s board and staff in March of 2014, U.S. Senator John Thune (R-SD) signed on as a co-sponsor of the Public Power Risk Management Act. Senator Thune is in the center in a blue tie. The Public Power Risk Management Act of 2015 includes some clarifications and simplifications to more closely align the legislation with regulations adopted by the CFTC. One substantive change to the bill would allow the CFTC to refine the types of transactions that can qualify for the relief. “It’s essential that public power utilities maintain access to swaps in order to keep power affordable,” APPA’s Kelly said last December. The Public Power Day of Giving is a community service opportunity for attendees of APPA’s 2015 National Conference and guests. The 8th annual Public Power Day of Giving is on Friday, June 5, in Minneapolis, Minnesota. Join APPA staff and your colleagues across the country to serve with one of three local service organizations for a day. Feed My Starving Children: Hand pack meals that are shipped out to feed malnourished children in nearly 70 countries. Minneapolis Parks: Plant, weed, and help with gardening projects in Minneapolis’ Lyndale Park Gardens on the shore of Lake Harriet. Tubman: Paint, garden, and spruce up facilities at Tubman, an organization serving women, children, and families struggling with relationship violence, substance abuse, and mental health challenges. Volunteers must sign up online before May 15. Registering for the National Conference does not automatically sign you up for the Day of Giving. You must sign up separately. All APPA National Conference attendees and guests are all welcome to participate in the Day of Giving. Unskilled volunteers are welcome and tools and materials are provided. The APPA National Conference helps utility leaders connect with partners and peers while learning about the complex issues facing public power utilities. The program features leading political, economic, business and public policy thinkers addressing the critical issues shaping our industry’s future. This article originally appeared in the March 9, 2015 issue of American Public Power Association’s Public Power Daily. The U.S. Senate Committee on Environment and Public Works will hold a hearing Wednesday, March 11, to hear from state utility regulators on their views of the Environmental Protection Agency’s proposed rule limiting carbon dioxide emissions from existing power plants. The proposed rule is known as the Clean Power Plan. The draft EPA rule, issued by the agency in June 2014, is designed to require states to cut carbon dioxide emissions from existing power plants from 2005 levels by 30 percent by 2030, according to the agency. Witnesses will include Thomas Easterly, a commissioner with the Indiana Department of Environmental Management; Todd Parfitt, director of the Wyoming Department of Environmental Quality; Michael J. Myers, section chief with the Environmental Protection Bureau at the New York State Attorney General’s Office; Ellen Nowak, chairperson of the Public Service Commission of Wisconsin; and Mary D. Nichols, chairman of the California Air Resources Board. The Senate hearing will take place the same day as a regional technical conference that the Federal Energy Regulatory Commission (FERC) is holding on the EPA proposal in Washington, D.C. that will focus on the EPA rule’s potential effects in the East. The House Energy and Commerce’s Subcommittee on Energy and Power will hold a hearing March 17 to examine the EPA’s proposed plan. At a Feb. 19 technical conference held by FERC to examine the EPA plan, the American Public Power Association’s president and CEO, Sue Kelly,urged FERC to take an “active role” on the EPA plan. See also Kelly’s blog on the topic. Learn about leading economic development issues, strategies and best practices while networking with peers from across the country at the inaugural Public Power Consultants Forum from Area Development in conjunction with the American Public Power Association (APPA). The new annual event will feature expert presentations and roundtable discussions on drivers of the site selection process, business retention and attraction strategies, growth industries, and guidance on how utilities can work with economic developers and businesses. Monty Hamilton, CEO, Rural Sourcing Inc. The forum is designed to educate public power utility economic developers, CEOs and executive leadership–as well as the policymakers, community officials and state/regional economic developers they work with–on success strategies and best practices in economic development. For more information, visit the Area Development website or contact Heidi Lambert, APPA’s Director of Education at 202-467-2921 or HLambert@PublicPower.org.